Knowing that jetlag would be an issue for any traveler crossing the international date line and sleeping in different beds, etc we planned on a couple of weeks first in Taiwan, ROC; which is only 1.5 hours by flight from Japan and only off by 1 hour in timezone. This excuse also provided us with more vacation abroad, time to visit my wife's family and for me to try some new beers and hookup with hard-core trail runners in Taiwan! I had the great pleasure of finding the informative blog (Taipei Runner) and connecting with its author Amber. She also has a Facebook page you can find here. 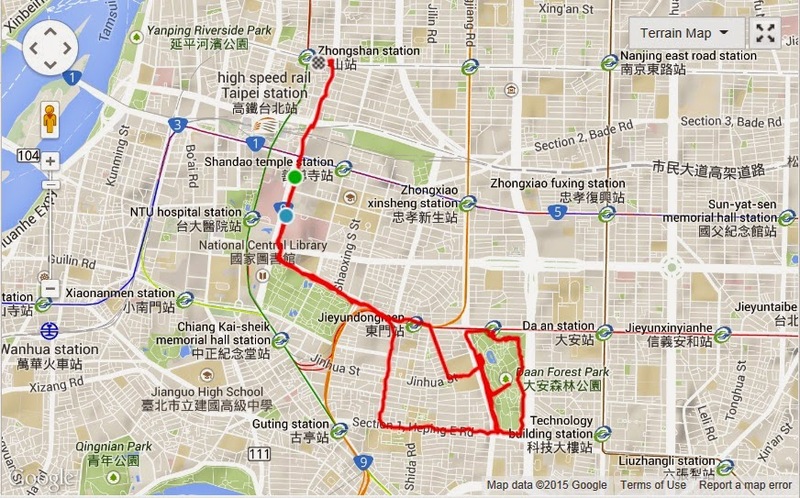 Here are three fun runs you can do while in Taipei. I'll provide links to other running groups also in Taipei that I didn't get a chance this time to run with but want to next time I'm in Taiwan. When ever I'm in Taipei, I also get in a run along the River Park aka along the JiLong River because it is well marked, paved, has periodic restrooms, occasional drink kiosks and is easy to get to from the subway (MRT). We happen to be staying at a local hotel at a discount (3D2N Special) called the Landis near the ZhongShan Elementary School and the 'Orange' Line 4 MRT. So, to get to a good starting place on the River you could take the 'Orange MRT westward a couple of stops then transfer to the 'Red' Line 2 'DanShui' link up to YuanShan Station. If you exit the YuanShan Station you will be at the Taipei Expo center which also happens to be near a convenient north exit to the River Park. 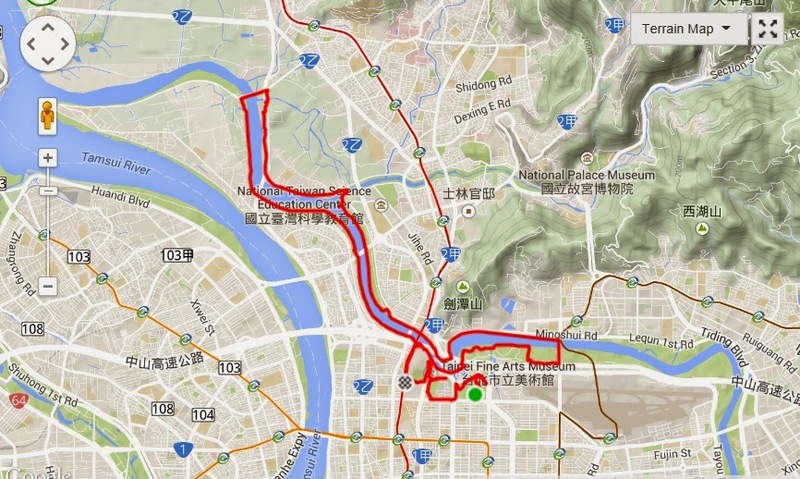 Since I was so close to the Taipei Expo center anyway I just hiked from the hotel directly via JiLin Road there. Once you get to the Yuanshan MRT Station you will see the Taipei Expo Park sign (can't miss it) as well as a sprawling park. There is always something going on here so expect people and workers setting a stage for something. As soon as you exit the station, if you turn left and head north you'll come along a bike path that will dump you on the main east/west paved river park trail. I don't know the name of the little road but it run literally under the Red MRT line. So, if you follow under the MRT you won't miss it. Once you get to the river you have two choices : go west or go east. East will take you towards the big DaZhi suspension bridge. If you go west you will go towards the big white BeiTou suspension bridge. You can't miss this bridge because it is to the left of the most visible smoke stack (BeiTou Incinerator). There are bathrooms along the trail but I only remember ever seeing places to buy/food drink on the DaZhi side in the DaJia Riverside Park. In fact, this is where I normally buy more Pocari Sweat sports drink, snack and possibly a Taiwan beer. What does the river park 'trail' look like? The 'park' is 99.99% paved road that ranges from narrow two lane to wide double pedestrian/bike lanes. It is common to see other runners, walkers and cylist also enjoying the park. What can you see? Besides the river and a few land marks like Grand Hotel there are several tennis courts, baseball diamonds, local temple and the occasional local shop. The weather is also typically milder cuz of the large body of water and with a slight breeze (invaluable in the summer months). There are numerous parks large and small throughout the big city of Taipei. If I can't get to the River Park and I'm tired of my local Linsen Park, I like Da-An because it's large, has restroom, drink stalls, has it's own MRT station and there is a local nearby streets with tons of small perl-tea shops and eateries to visit. Also, because of a near-by language school and National Normal University there are more foreigners hanging out in this area than you can shake a stick at. So, if you get lonely for your native mother tongue and don't want to go all the way to TianMu you can come to Da-An Park or the nearby food restaurants to the West along YongKang street and park. Amber and I agreed to meet at the 'Red Metro Line 2' station named JianTan then go by public bus to the YangMing Park bus center entrance. From the bus drop off we proceeded up a paved path, steps, more steps until we came to our first landmark which I believe was DaTun Waterfalls. Next more steps and road that eventually lead to the sulfur deposits, fumaroles just before you get to XiaoYouKeng Visitors Center. One note about this area is that the moss covered stone steps are treacherous. I was wearing my Hoka Stinson trail shoes with the little sticky 'nubs' which partially gripped the rocks but not quite. I couldn't imagine running up/down this area in a race. Then, Amber said one of the reasons she wanted to run this particular route was because in a few weeks they'd be racing it! This course takes guts to actually run it. Just after the visitors center you start the 'East Peak' trail that leads to and just past QiXing Mountain. The peak provides an amazing view of the northside which you normally don't get a good look of. We were still in winter so none of the calla lilies were in bloom but you could still see a sea of plants and could easily imagine what the field might look like (and smell like) in full bloom. Funny I had just watched a cooking show on TV where the cook grew his own lilies but deep friend them in batter for his own consumption and sold them. I was starting to get hungry. On the east side of the mountain eventually you come down to MengHuan (Dream) Lake just before LengShueiKeng Visitors Center. Down, down, down until you eventually get to a sign that reads, "Trail closed, no entry" and leads to a grass field/dry marsh, criss-crossed with paths made by other runners, pheasant and range cattle. Somehow Amber was able to read the range and figure out how to cross to get to some of the most beautiful single track I've seen. It also became apparent that this hidden area was a favorite by all the local trail running clubs/teams because many multicolored ribbons could be seen hanging from trees. The single track was steep, technical and you felt you were finally on a nearly tropical island because of all the flora and fauna. There was one particular place where a very nice person setup a line down the trail since otherwise I wasn't sure how we were going to get down - except sliding on our sides or behind. Eventually we got to Amber's secret creak/canal path named 'NeiShuangXi'. At first I didn't know what to think about running on side a dirt/cement path 2 feet wide framed with mountain to the right and a severe drop-off to the left. But I got used to it, no, I started to love it. After 5 and half hours, 14 miles and 3,477 ft of vertical we had made it. 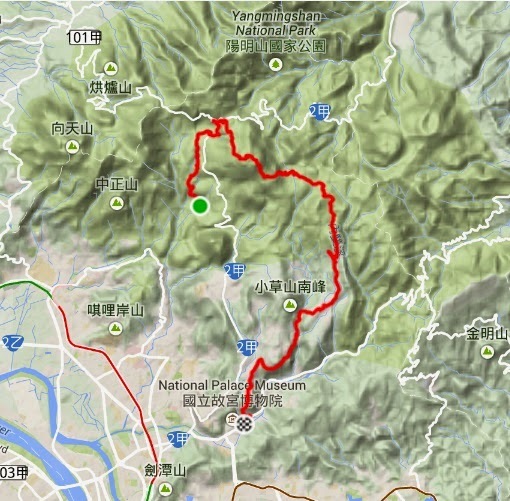 We not only summited one of the tallest mountains in YangMing Park, but hit several other landmarks in the area. We were in a mode for recovery and to celebrate the day. Amber didn't have to think long and we headed for her favorite pizza place for carbohydrates and more carbohydrates. Was a great day for a trail run and greatly appreciated Amber and her friend Orrin's local trail knowledge and hospitality. Nothing says I've finished a great trail day like pizza and beer!